Where else could you find Superman, the Lone Ranger, Space Ghost and Frankenstein Jr. together but 1960s CBS Saturday Mornings? With the Lone Ranger and Tonto making an appearance down in the lower left-hand corner, this 1960s ad is a nice intermission break for the “We don’t need no stinkin’ Lone Ranger!” two-parter. What to make of this old-timey assemblage? 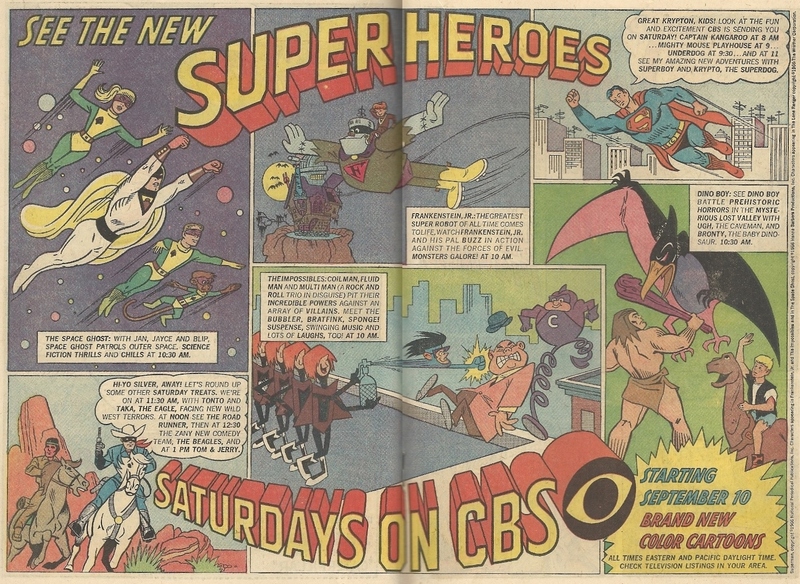 While I’m personally thankful to the powers-that-be for greenlighting Space Ghost, which blew but provided animation fodder for the greatest, funniest, trippiest interview show of all time, I’m uncertain as to whether this lineup stacks up to the great Saturday cartoon blocks of my youth — and some of the lesser ones. It’s a generational thing, I know (my cartoons can beat up your cartoons), but is anyone yearning for the days of Frankentstein, Jr.? I mean, we had the Snorks, but geez.